Cheetahs can be skittish. Labrador Retrievers are not. Dallas is not the only zoo that has raised them together from kittenhood and puppyhood. 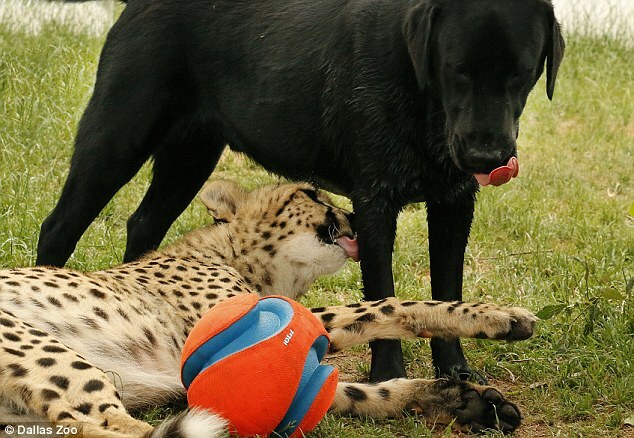 The Cheetahs who are raised with dogs are used for educational purposes; going to schools and events to educate people about their plight and what they can do to help in the conservation effort of this gorgeous, endangered animal. An event of this kind might be held at a venue where the Cheetah and dog need to go up a flight of stairs or enter an elevator, for example. 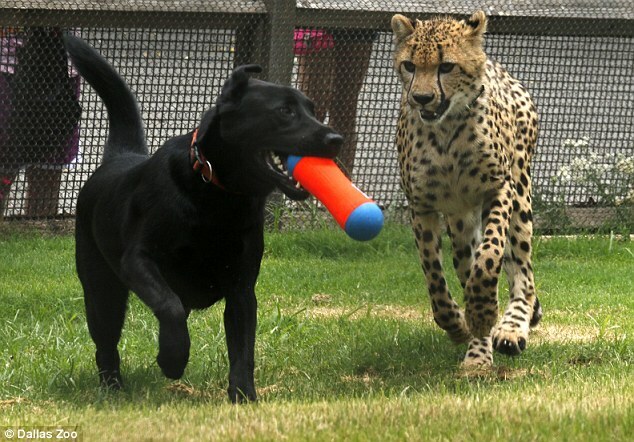 Either of those would freak the Cheetah out, but when he sees his dog brother happily comply, he gains the confidence to do it, too. Amani and Windspear as babies. Cheetahs can go from zero to 70 miles per hour in 3 seconds. They are the fastest of the land animals. I know that but I’m wondering why they say, “land animals.” Is there a sea creature that goes faster than that? I need to google that. The only thing Cheetahs eat is meat and when they make a kill they eat almost as fast as they run because inevitably a larger cat will smell the kill, run the Cheetah off and finish the meal. So, Cheetahs have to eat as much as they possibly can as quickly as they possibly can. I’ve noticed that when Windspear and Amani play chase, Amani is by far the fastest dog I’ve ever seen in my life. Being raised with Windspear must have busted through his genetic inclinations and inborn perceived limitations about how fast a Labrador Retriever can run. At 2:30 four days a week, the zoo does a show called “Cheetah Encounter.” It is an opportunity for zoo guests to see how fast Windspear can run and also to see him playing with Amani and interacting with his keepers. I go often to see it. One day I saw a guy wearing a zoo employee uniform, which is only slightly different than the volunteer uniform I wear. Like me, he also wears a nametag, which I didn’t bother to look at because I couldn’t care less who’s who at the zoo. 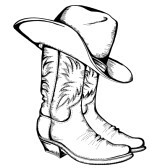 I walked over and introduced myself, he said his name was Kevin and we got talking; or should I say I got talking. 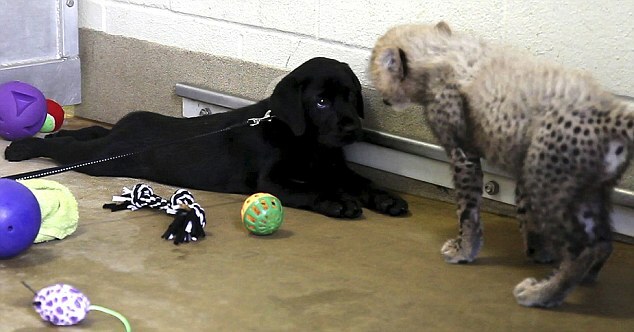 “I was surprised when I saw the keepers in with the Cheetah,” I said. While I was beginning to suspect Kevin was the strong, silent type, he saw me glance at his nametag. It said. Kevin Thomas, Director of Zoo Safety. We locked eyes and both burst out laughing.